Agriculture – both victim and cause of climate change. New research shows moving away from animal protein towards legumes makes sense nutritionally and environmentally. Agriculture is often thought of as being at the mercy of climate change, with increasing droughts and flooding resulting in lower yields, especially across the developing world. Yet the agricultural sector also contributes significantly to greenhouse gas emissions, itself exacerbating climate change. In fact, recently agriculture was identified as the second biggest emitter globally, producing around 10-13% of emissions. A substantial amount of these emissions comes from livestock farming with the production of the gas, methane. TRUE, an EU-funded project, has found evidence that switching diets towards plants as sources of protein as opposed to meat, is much more sustainable. In a study conducted by one of the TRUE project partners, Trinity College Dublin, researchers scored legumes by their environmental cost of production (including greenhouse gas emissions, groundwater pollution and land use), as well as according to their nutrient content. The results clearly showed that plant protein sources (legumes) had the lowest environmental production cost, while at the same time demonstrating the highest density of nutrients. Putting this finding into context with an example for "Trinity News," Assistant Professor in Botany at Trinity, Mike Williams is quoted as saying, "Peas have a nutrient density to environmental footprint ratio approximately five times higher than equivalent amounts of lamb, pork, beef or chicken." The researchers used the environmental and nutritional criteria to test a number of dietary scenarios, which has enabled them to quantify specific environmental benefits, against instances when consumption of animal protein is decreased. This quantification means the research has a very practical value for the development of policy and ultimately consumer education. Prof. Williams adds, "Such quantitative estimates of sustainable food and agriculture will hopefully allow a more informed choice for consumers when considering the main protein component of their diet." The team are working ultimately to balance social, environmental and economic needs throughout the supply chain. This includes ensuring high nutritional standards, along with general health and wellbeing for people and animals, while minimising environmental impacts and optimising commercial diversity and efficiency. In its quest to enable the success of future legume production systems, including for agri-feed and food chains, the TRUE (Transition paths to sustainable legume based systems in Europe) project brings together 22 partners, representing business and society interests. It is further supported by a series of 15 farm networks and includes the development of seven innovation Case Studies looking specially at supply chains. The researchers are employing life cycle analysis techniques which apply advanced mathematical analysis to fine-tune processes, as well as using modelling to design Decision Support Tools to aid the transition. To increase the likelihood of success for these new farming, processing, manufacturing and retailing practices, the project will also make policy recommendations. Alicia Kolmans, from the Research Centre for Global Food Security and Ecosystems in Germany, says, "These first results of the TRUE Project are an important orientation for European consumers and decision makers, considering the risks to society emerging from the global increase in animal protein consumption, including growing environmental problems and increased food insecurity due to the competition between food and feed on global fields." Well, this certainly sounds like a good idea. Frankly & Ernestly, I have no enthusiasm for giving up scorched meat byproducts. Where do you get the cheese, butter, milk and eggs, then? About 20% of beef production for example is actually a byproduct of the dairy industry. If you think about how much food and cooking actually consists of animal products, and how the substitutes are much inferior to the real thing - like frying with hydrogenated vegetable oils (margarine) vs. real butter, or making eggless cake batter - it becomes immediately obvious that the question is not simply about replacing chicken nuggets with soybean, or having steam expanded shredded black beans swimming in a box of marinade made to resemble beef wok. All those are just artifical imitations, and generally bad cookery as they have to be made in a factory, tv-dinner style, since the processes are too difficult to replicate in your home kitchen. Some of them are downright sickening to eat. It's a question of overthrowing entire culinary cultures with processed foods. Now, I can cook some beans, but that won't replace meat. I stopped eating meat, it's not bad at all. Highly recommend the soy ground meat substitutes, the texture is the same and with spices and flavorings it's really good. After stopping I can see why people prefer digesting things easily and having more energy. I did it out of conscious, I see animals personalities, I know they feel emotions, I just can't take part in the crazy nightmare that is industrial animal slaughtering and processing. But I am much better for it. If your like me, over 40 and actually dont want to feel that way physically, stopping the consumption of more difficult to digest food is highly recommended. Saves your body the hassle, gives you a little age denying boost of energy. I cook at home, there is nothing about vegetarian food that is any more difficult than other types. (I do eat dairy products, mmmmm cheese!). I say take a step back. Stop trying to tell people what to eat. Big government in every kitchen. Leave it alone. The price will dictate what people will eat. When population increases and land values skyrocket people will eat what they can afford. Plant based protein and iron isn't near the quality of animal protein/iron and it's also harder to digest and process. Plant based iron is next to useless. Another thing, a diet should be individualized to fit individual needs. This sweeping notion that everyone needs to be on the same plan to save Earth is not only misguided and potentially dangerous but is simply outdated. Too bad this is another agenda pushing article as my limited time here thought maybe this is one of the few spaces on the net without the biased noise. But, still they want to eat animals. Animals eaters have destroyed this planet earth, and they don't even realize this!! I cook at home, there is nothing about vegetarian food that is any more difficult than other types. The point I was making was about the modern meat substitutes being impossible to make/cook at home. Vegetarian food is fine, but for people who eat meat, it's not a substitute. That's why the food industry is trying to mimick meat products like hamburger patties - but they're forgetting that these ready-made options are just cheap substitutes for the real thing in the first place. I did it out of conscious, I see animals personalities, I know they feel emotions, I just can't take part in the crazy nightmare that is industrial animal slaughtering and processing. (I do eat dairy products, mmmmm cheese!). Then you're a hypocrite. Cows are artifically inseminated to keep them perpetually pregnant, to keep them producing milk, and the calves are killed, except when they're raised up into more milking cows. Humans have been eating meat since before we were humans, so really you're blaming everyone. If it's not a question of ethics, it's a question of resource management. There, the main problem isn't eating meat, but billions and billions of people eating meat - overpopulation. Incidentally, the greatest problem of overpopulation and hunger is in countries that already subsist on mostly vegetarian diets, and the reason why their peoples are being sickly is because they don't have an adequate supply of proteins and fats, iron, B12 etc. You'd think they would have figured out to grow and eat a larger portion of legumes, if it's such a great source of protein, but for some reason they haven't. Why? The answer actually comes from the biology of legumes in the first place. 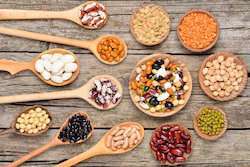 They contain phytic acid, which binds to the nutrients and prevents absorption in the gut, which is what causes you to have wind when you're eating beans and peas - when your gut doesn't absorb the nutrients, the bacteria in your gut do and produce gas. It's the same problem if you're eating excessive quantities of nuts - it gives you bellyaches. So legumes need to be cooked in specific ways to get rid of the phytic acid, which is an energy consuming process. vegetarians might tout them as a "protein source," but this is only really true relative to foods like bread and vegetables, which have no protein at all. One cup of black beans, for example, has approximately 230 calories, with around 170 of those being from carbs. Only around 53 of the calories in this "protein source" are actually from protein. (...) eating beans as a staple source of calories will quickly deliver many more carbohydrates than your body needs. In conclusion, the main problem with most beans and legumes might be negative, rather than positive: when eaten as a staple food, they simply crowd out more nutritious foods like animal products. Combined with the phytic acid and lack of fats in the legumes themselves, this can lead to a perfect storm of nutritional deficiency. a diet based on high-quality animal foods is much more nutritious without requiring all the annoying and time-consuming preparation of soaking, sprouting, and fermenting – and it tastes better. So, legumes are a great source of protein - as long as you separate the protein, eliminate the poisons, and balance out the carbs/protein/fat ratio. That means industrial processing or energy and labor-intensive cooking processes and other supplemental sources of protein and fat. In places like Africa where legumes are an important staple, they're still often fed to animals to upcycle the proteins to a more human digestible form. @Eikka: This protein myth, in the so-called educationally advanced countries, needs to be debunked. A human can easily live all his/her life without even touching meat. A significant part of Indian population (that's now 1.35 billion humans) have been living on strictly plant-based diet for tens of thousands of years and they still continue to do so (consider exceptions). They didn't die due to protein deficiency! If people can't stop eating animals and thereby supporting meat industry, consider buying an animal and kill it in their backyard and cook as per wish. Don't buy the meat, buy the living animal. We need legislation on this. guptm, you've heard about my family's barbeques, have you? Since you brought up legislation and dietary satisfaction... Bismarck said "You never want to watch a farmwife make sausages or legislators making law!" My joke to annoy my vegan inlaws... "The difference between carnivores and herbivores is, that the carnivore's prey can run away." I never met anyone who killed an animal in their home every time they wanted to eat meat, for every meal - that's a caveman life style! People living in Amazon forest still practice it. Learn! Can you do that too? People don't want to be a vegetarian because they can't control your palate. Can you? They prefer destroying the planet to controlling their palate. @Eikka: This protein myth, in the so-called educationally advanced countries, needs to be debunked. A human can easily live all his/her life without even touching meat. It is also possible to live all your life without water or air. Albeit a very short life. Just because you can doesn't mean it's the optimal diet, but that's also besides the point. Eating meat is a question of resource management, and the question of resource management is fundamentally a question of overpopulation - that's the real problem. Switching to plant based diets doesn't do anything about the fundamental issue - it's just a symptom of the Malthusian crush that happens when people expand to consume all the available resources to the point of their own poverty. People in India don't subsist on vegetarian diets because it's preferrable, but because there's 1.4 Billion of them. Eikka: "People in India don't subsist on vegetarian diets because it's preferrable, but because there's 1.4 Billion of them." You just gave an example of your capacity of understanding on this whole issue. Thank you for your time. For your knowledge, India not only feeds its own 1.3 billion people, but also exports food a number of other countries including so-called developed ones. And, they are not vegetarian due to overpopulation, but due to purely personal choice. Don't forget, USA is world's number 3 in population after China and India. In USA, you have no choice of vegetarian diet, that's because of overpopulation that eats only meat, vegetarian diet is not affordable because US can't provide vegetarian food to all its people. I understand people's helplessness in the so-called developed world. Thank you though for discussion. So-called developed countries have literally destroyed this planet! !